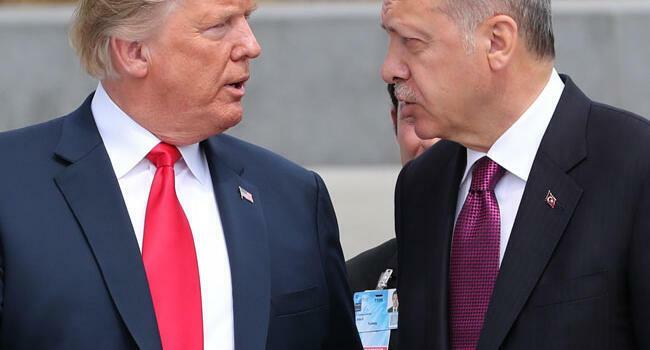 U.S. President Donald Trump praised Turkish counterpart Recep Tayyip Erdoğan for “doing things the right way” after being frustrated by the leaders of other NATO allies over defense spending, CBS reported on July 16. Trump had met with other NATO leaders in Brussels on July 11. Ian Bremmer, president of the Eurasia Group and a CBS News senior global affairs contributor, said on CBS This Morning on July 16 that only Erdoğan was left unscathed amid Trump’s angry rebukes during the summit. “Trump was very frustrated; he wasn’t getting commitments from other leaders to spend more. Many of them said, ‘Well, we have to ask our parliaments. We have a process; we can’t just tell you we’re going to spend more, we have a legal process.’ Trump turns around to the Turkish president, Recep Erdoğan, and says, ‘Except for Erdoğan over here. He does things the right way,’ and then actually fist-bumps the Turkish president,” Bremmer said. Bremmer also spoke about Mr. Trump’s announcement at the end of the NATO talks when he took credit for an increase in allies’ defense spending despite no announcement of increase.